This is a mind-bending mix of puzzle, adventure and platform game. Defy time and manipulate the past and the future, in order to fix the present. 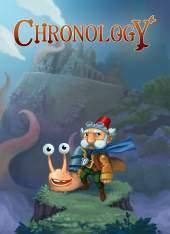 Travel back and forth in time, watch the world as it changes, and solve puzzles to proceed in a unique and beautiful universe, which mixes classical fantasy with mechanical retro futuristic elements. Anything is possible - think Day of the Tentacle meets Lost Vikings wrapped in beautiful painted graphics in the vein of Hayao Miyazaki and Shaun Tan. The past is industrial and pumping with mechanical steam energy. The future is an overgrown ruin and nature rules - everything has been destroyed but you have the power to change the course of time. Play as The Inventor and the Snail, and take advantage of their special abilities - Travel back and forth in time, stop time, manipulate objects and solve puzzles. Remember, time changes everything. This game is episodic in nature, in the sense that the first part can be played for free, while the second part is available as an in-app purchase. More episodes are on their way.